A drawing was held on Sept. 9 to help support Alzheimer’s Association. 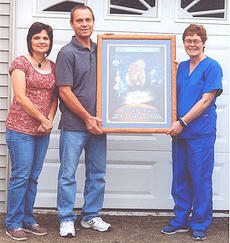 Kevin and Dora Bickett of Loretto donated a framed U.K. print. Pictured are, from left, Dora and Kevin Bickett and Cindy Burgos accepting the framed print for winner Chris Spalding of Loretto.